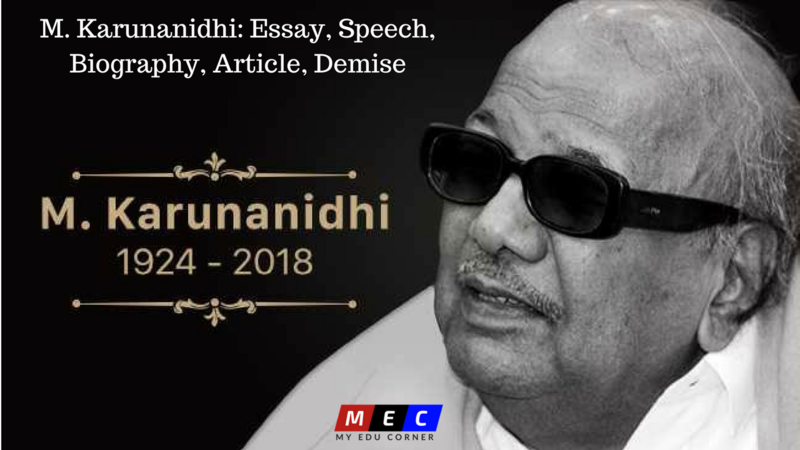 Muthuvel Karunanidhi (3 June 1924 – 7 August 2018) was an Indian writer and politician who served as Chief Minister of Tamilnadu for five terms and twenty years between 1969 and 2011. He was a long-standing leader of the Dravidian self-respect movement and ten-time president of the Drawid Munnetra Kazhagam political party. Before entering politics, he worked in the Tamil film industry as a screenwriter. He has also made contributions to Tamil literature, having written stories, plays, novels, and a multiple-volume memoir. He was popularly referred to as Kalaignar in Tamil Nadu by his supporters. Born in Thirukuvalai village in Nagapattinam district, he was born as a son of Muthuvelu and Anju. Karunanidhi was interested in the drama, poetry, and literature during his school season. Most people know M Karunanidhi’s political heir MK Stalin. But the Kalaignar has five other children. Not all of them ventured into politics. Some went into the film business, others into real estate. M. Karunanidhi, who was inspired by the speaker Azhagirisamy, considered the pillar of the Justice Party, completely engaged in social movements at his 14th age. He set an organization known as “youth revitalized the organization” with the help of his students. The organization helped young people develop their inspiration and writing. After some time, the state was formed as a state-level “All Students Club.” This was the first student division of the Dravidian movement. Karunanidhi also engaged the student community in social work with other members. DMK The party’s official newspaper, Murasoli started developing a newspaper for its members. The first major opposition to Karunanidhi’s support for Tamil politics involved in the Kallukudi demonstration (1953). The original name of this industrial city is Kallagudi. Dalmiya, which set up a cement plant is from North India and changed the original name Kallakkudi to Dalmiyapuram. DMK opposed the name change as it was seen as North Indian oppression of Tamil Nadu. M.Karunanidhi and his comrades posted papers on the name “Dalmiyaapuram” in the railway station name board and block the passage of the trains. Karunanidhi began his career as a screenwriter in the Tamil film industry. His first movie as the screenwriter was Rajakumari produced by Coimbatore based Jupiter Picture directed by A.S.A. Sami starring M.G. Ramachandran. During this period he and M.G. Ramachandran, then an upcoming actor and later day founder of AIADMK party started a long friendship eventually turning into rivals in later year’s politics. His stint with Jupiter Pictures then housed at Central Studios continued for another MGR starrer Abhimanyu(1948 film). Ramachandran, Marudhannaattu Ilavarasi, (1950) starring with M.G. Ramachandran and V. N. Janaki. Parasakthi (1952), one of the finest films ever produced in Tamil, could still evoke such strong emotions in viewers. This speaks volumes not just about its lead actor – Sivaji Ganesan – who went on to dish out more such memorable performances. It also speaks about Muthuvel Karunanidhi – its indefatigable scriptwriter – and who, in a sense, was also the hero of the film. Annamalai University awarded him an honorary doctorate in 1971. He was awarded “Raja Rajan Award” by Tamil University, Thanjavur for his book Thenpandi Singam. On 15 December 2006, the Governor of Tamilnadu and the Chancellor of Madurai Kamaraj University, Surjit Singh Barnala conferred an honorary doctorate on the Chief Minister on the occasion of the 40th annual convocation. DMK chief Muthuvel Karunanidhi passed away at the age of 94 on 07/08/2018 in Tamilnadu. For more than a year, Mr. Karunanaidhi has been in and out of the hospital while recovering from a lung ailment. He lived a secluded life — making no public appearance except for occasional visits to his party office.